MINERALNYE VODY, May 28. /TASS/. A decision on whether to announce evacuation in the east of the southern Russian Stavropol Territory amid a threat of flooding will be made at noon Sunday, the region’s governor Vladimir Vladimirov said. "The evacuation of residents from areas under the threat of inundation will begin if the situation gets worse. The decision will be made at noon May 28 at a meeting of the regional emergencies committee. Until that, we will put all our resources on alert for possible evacuation," the Stavropol Territory administration’s press service quoted Vladimirov as saying. More than a thousand of trucks and 200 buses have been prepared. The possible evacuation will also involve rescuers, servicemen, National Guard members and students. "The situation is being constantly monitored by the regional emergencies ministry department, the governor and the administration of the Stavropol Territory," the statement reads. 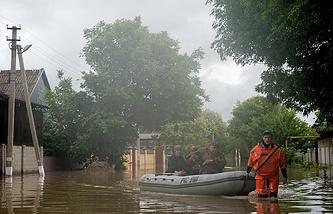 Last week, rivers swollen due to heavy rains inundated a number of settlements in Stavropol Territory’s Mineralnovodsky district, triggering a massive rescue operation. Although no rains took place in past days, rivers brought their high waters to the east of the region. Currently, the town of Zelenokumsk and a number of villages with a combined population of some 40,000 are under threat. Meanwhile, waters subside in the previously flooded areas. On Saturday, water receded from more than 200 households. "A total of 1,559 homes remain inundated in nine municipal areas, which is 230 homes less than this morning," the regional emergencies ministry department said on Saturday evening. "More than 2,300 people, including 1,000 children have been relocated for security reasons." "Additional 35 disaster recovery teams with special equipment have been set up. Their members are students of the emergencies ministry’s academies," the ministry said. In total, the rescue operation in the Stavropol Territory involves over 3,500 people and over 600 pieces of equipment, including 100 boats.